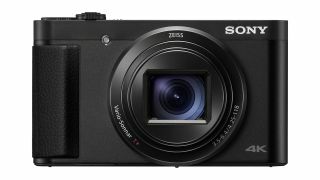 Sony has given its Cyber-shot travel-zoom compact line a revamp with the introduction of two new models. The 18.2MP HX99 and HX95 are each furnished with ZEISS Vario-Sonnar T* optics, whose focal range equates to 24-720mm in 35mm terms. Thankfully, this mammoth objective is supported by Optical SteadyShot technology to keep things crisp at all focal lengths. Images can be captured in both Raw and JPEG formats, and composed with the retractable 638k-dot OLED TruFinder, or alternatively the 3in, 921k-dot tiltable touchscreen, the latter flipping up and around a 180-degree angle to face the front. 4K UHD video with full pixel readout and no pixel binning is also on board both cameras, while Full HD footage can be recorded at frame rates up to 100fps for slow-motion playback. This is complemented by a range of useful features for videographers, such as focus peaking, zebra stripes and control over the level of the built-in microphones. Driving all this is an upgraded version of the company's BIONZ X image processing engine, which works in concert with a newly implemented front-end LSI to help deliver 10fps burst shooting for an impressive 155 frames (when set to the Speed Priority Continuous Shooting option). In addition to focusing speeds as swift as 0.09 sec, courtesy of a Fast Intelligent AF system, the popular Eye AF feature, which identifies and keeps a lock on a subject's eyes, has also been inherited from the company's pricier Alpha models. The only differences between the two cameras appear to be a control ring on the HX99, which allows the user to adjust manual focus, step zooming and so on, and Touch Focus and Touch Shutter, which is also only included in the HX99. Other notable features on both include a built-in flash, Bluetooth and NFC for connecting to smart devices, and a maximum ISO of 6400. The HX99 will retail at approximately £450 in the UK while the HX95 will be priced at around £430. The two new models are set to be available from October. Pricing for other territories is yet to be revealed but we'll update this page as soon as we have it.